Our next tattooed contributor, Alex Giardino, identified herself to me more as a translator than a poet, but one needs a poetic sense to be able to translate successfully, in my opinion, so she was in. Not to mention, her tattoo is a poem fragment by Kazim Ali, who not only has appeared on the Tattooed Poets Project before (originally here), but has been a wonderful help this past month referring me to other tattooed poets (and translators). Tattoos, for me, are thunder strikes. They are conceived in a single moment of electric clarity. Like love at first sight. That was how I felt when I heard Kazim Ali read his poem “The Escape” in Napa one warm spring evening in 2014. As Kazim stood before a crowd and read these lines, “Finally free of the labyrinth and overhead nothing but sky,” I felt a jolt of clarity. These lines must be printed across my right shoulder. But, first, there was the labyrinth, a tattoo I had done in Mexico City in December 1996 at a studio somewhere in the Colonia Roma. 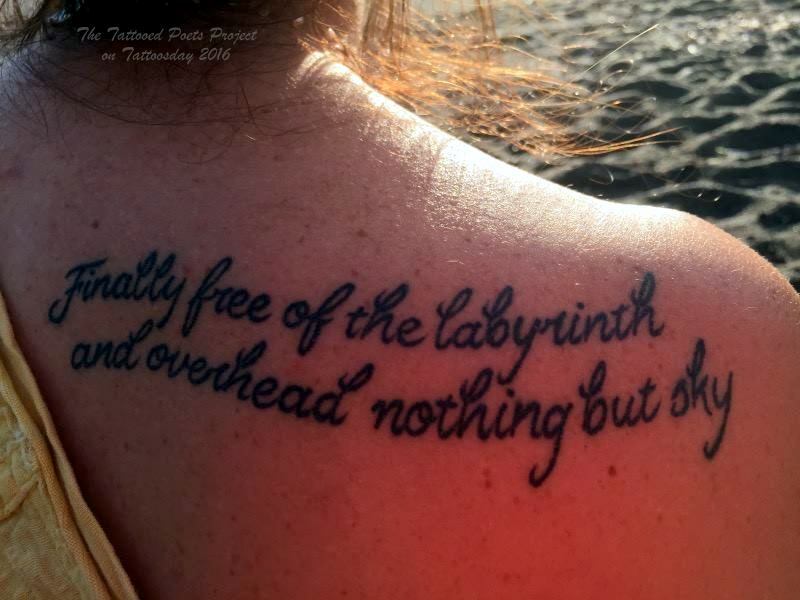 It was my first tattoo: an image I stole from the cover of Octavio Paz’s book The Labyrinth of Solitude. I hadn’t read much of the book, and yet I was utterly familiar with his argument, especially this line, “Man is nostalgia and a search for communion. Therefore, when he is aware of himself he is aware of his lack of another, that is, of his solitude.” I had been living in Mexico for several months, unable to speak Spanish, in a failing relationship and often wandering alone down ancient streets. The tattoo would be my reminder of that time, when I felt trapped in a labyrinth of solitude. Despite twice being redone, the tattoo eventually became a dollar-coin-sized indigo blur on my left shoulder. Flash forward to that warm 2014 evening, eighteen years later, when I was listening to Kazim read. By now, I had been freed of that sense of isolation and loneliness I felt in Mexico because I had found communion with other writers and with my own writing. Now, there was Kazim, a poet-teacher, reading before me and his boyfriend Marco, my fellow MFA student, sitting next to me--both of them a part of my extended writing community. 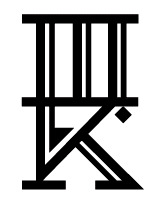 The thunder strike: I am free of that labyrinth, and to mark that awareness, a tattoo of Kazim’s words. I waited a few months, until my birthday in late August, to have the tattoo done, a gift to myself to mark 48 years. 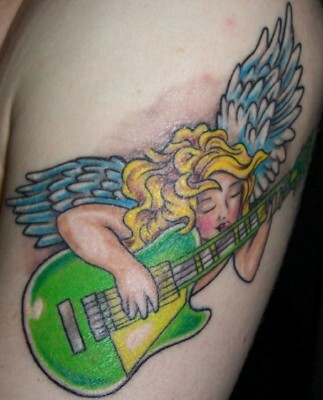 It was inked at Spider Murphy’s in San Rafael, California. Waiting those few months to have the tattoo done gave me time to think about my understanding of Kazim’s lines and of the myth of Icarus and Daedalus that inspired them. That myth tells us that creation cannot exist without destruction. The artist knows this. Invention for invention’s sake is not enough. Sacrifices must be made, and consequences faced. “To create a beautiful, well-wrought sculpture from a block of stone, one must destroy all the other possibilities inherent in the stone.” When one story is told, a thousand others are not. As I walked out of Spider Murphy’s with Kazim’s words on my shoulder, I wondered: What do I make now of the open sky above? I choose stories to write every day, aware of the sacrifices and consequences of telling them. Octavio Paz, The Labyrinth of Solitude (New York: Grove Press, 1961), 195. Kristopher James Ide, “The Daedalus of History and Myth: The Meaning of Creation in Literature from Homer to Joyce” (Honors Thesis, Dept. of Comparative Literature, UC Davis, 2011), p. 30. Alex chose to share all of Kazim's poem, from Sky Ward (Wesleyan 2013), with his permission, below. Alex Giardino is a writer, translator, and teacher living in the Bay Area. She received an MA from Mills College and an MFA from the Stonecoast Program at the University of Southern Maine. Her work has appeared in various publications and on air. She translated My Life with Pablo Neruda and is now at work on several picture books for children. More about her work can be found at alexgiardino.com. Kazim Ali is a poet, essayist, fiction writer, and translator. His books include The Far Mosque, The Fortieth Day, BrightFelon, and Sky Ward He teaches creative writing and comparative literature at Oberlin. His website is kazimali.com. Thanks to Alex for sharing her words and her tattoo with us here on Tattoosday! Thanks also to Kazim for inspiring the tattoo and for his continued support of the Tattooed Poets Project! This entry is ©2016 Tattoosday. The poem and tattoo are reprinted with the authors' permission.